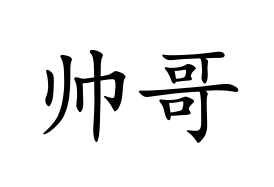 shuài gē 帅哥 literally translates as “handsome older brother” and is basically the male equivalent of měi nǚ. As with of měi nǚ, shuài gē is a generic term aimed at any young male whose name is unknown. So sorry to bust the egos of any young men already in China – just because she called you “handsome” it does not mean she wants to get with you. There is still a good chance the only reason she gave you her number is because she wants to practice her English. In fact, young men going to China should not be surprised to hear shuài 帅 used a lot more liberally than the word handsome would be in English. One fascinating aspect of Chinese culture is how compliments will be customarily paid in a very perfunctory fashion. Or to put it another way Chinese girls will call you shuài even if you’re not, and they will tell you your Chinese is great even if it’s so bad they can’t actually understand what you’re saying. gē 哥 refers only to older brothers, as there is a separate word for younger brother. In fact the Chinese language is extremely specific when it comes to the exact status of a family members. For example there are different words for “uncle” depending on whether it’s your father’s older brother, younger brother, husband to his older sister, or husband to his younger sister. And just when you think you got it figured out you will discover there are a whole different set of words for “uncle” on your mother’s side of the family. These extremely specific family terms are important because, as I mentioned last week, Chinese people usually do not call each other by name. If I call my father by his name it would be a bit weird, and the same goes for Chinese people and all their family members. So boys, if it turns out the girl calling you shuài gē is actually interested in you, you might still want to back off. Imagine if you got into a relationship with a Chinese girl and had to meet the family. It’s a terrific headache just remembering what to call everyone. Beyond the obvious male-female distinction there is another important difference between of měi nv̌ and shuài gē. That is, men can call women měi nǚ, and women can call other women měi nǚ. However, only women can call men shuài gē, if a man calls another man shuài gē it might seem a bit camp. And when I say “a bit camp” I actually mean “a lot camp”.